The Embraer EMB-505 Phenom 300 is a twin-engined light jet aircraft for nine passengers and a two-pilot crew. The aircraft has a low-positioned, swept wing and is powered by two rear-pylon-mounted Pratt & Whitney Canada PW535E turbofan engines. It has a horizontal stabiliser in a T-tail configuration and a retractable tricycle landing gear. The enclosed "oval-light" cabin has room for nine passengers and a two-pilot crew; during single-pilot operation an additional passenger can be carried. Embraer, the Empresa Brasileira de Aeronáutica S.A., is a Brazilian corporation, founded in 1969. Embraer was a nearly bankrupt concern when it was restructured and privatised in 1995. Today it is one of the largest aviation manufacturers in the world, producing regional commercial, military, and corporate aircraft. The Phenom 300 is the big brother to the EMB-500 Phenom 100 very light jet and the fourth member of the Embraer's executive transport portfolio. The prototype Embraer EMB-505 Phenom 300 c/n 00001 PT-XVJ flew first on 29 April 2008, and type certification was recieved on 3 December 2009. The first custom delivery of the EMB-505 Phenom 300 took place on 29 December 2009. Today, over 325 Embraer EMB-505 Phenom 300 aircraft have been delivered to operators all over the world. 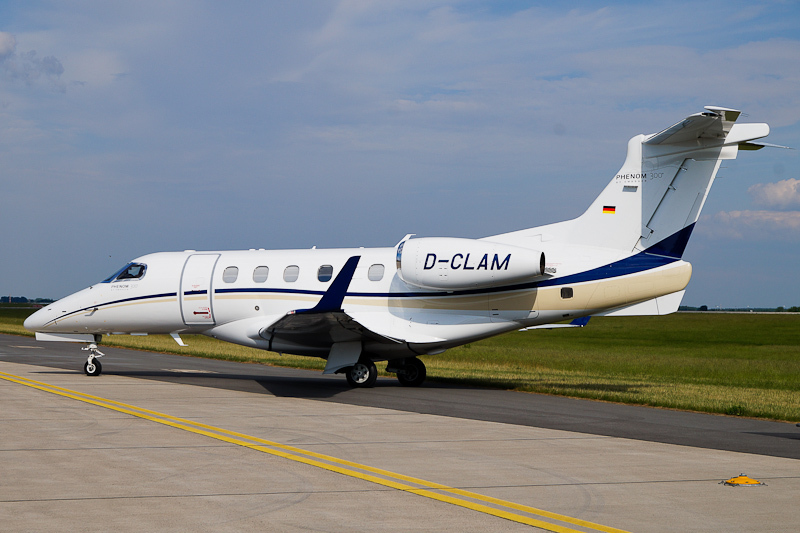 The 2012 built Embraer EMB-505 Phenom 300 c/n 50500108 was tested as PT-TOD before it on 23 July 2012 was registered D-CLAM in Germany. On 19 August 2012, the aircraft was delivered to Liebherr Aerospace, part of the Liebherr Group. On 3 June 2016, Embraer EMB-505 Phenom 300 D-CLAM was seen during the ILA Berlin Air Show 2016 at Berlin-Brandenburg / Willy Brandt International Airport.